White House National Economic Council Director Larry Kudlow holds a news briefing about the upcoming G7 meetings in the Brady Press Briefing Room at the White House, in Washington, D.C., on June 6, 2018. President Donald Trump won’t back down on his trade and tariff dispute with U.S. allies even as Prime Minister Justin Trudeau and other leaders plot ways at the Group of Seven Summit to convince him to reverse course and head off a potential trade war. There were reports on Wednesday that the White House is discussing additional sanctions against Canada in retaliation for Ottawa’s threat to impose tariffs next month on roughly $16-billion of U.S.-made products . But Mr. Kudlow said Mr. Trudeau, who is playing host in the picturesque village of La Malbaie, Que., and the other leaders are mistaken if they think the President can be turned against his America First trade agenda. “There are disagreements. 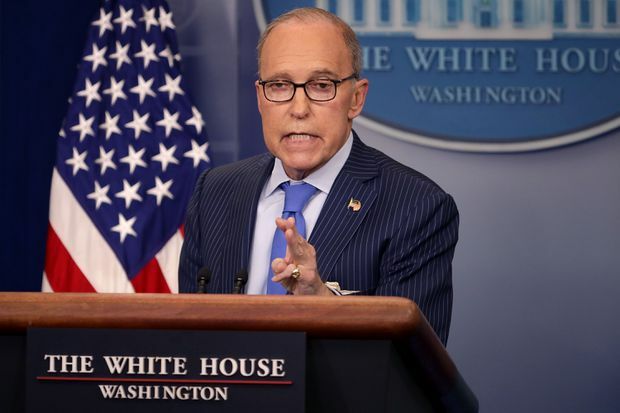 He is sticking to his guns and he is going to talk tough to them,” Mr. Kudlow said at a White House briefing on the two-day G7 Summit that begins Friday. At the same time, Mr. Kudlow played down any fears the tariffs could prompt a trade war and stall global economic growth. “Look, we are talking everything through. There may be disagreements. We regard this as much like a family quarrel. I am always an optimist and believe it can be worked out,” he said. Still, Mr. Kudlow said the President believes the global economic system is broken and tilted against the U.S. economy. Last week, Mr. Trump imposed steel and aluminum tariffs on the European Union, Mexico and Canada – a move that could cause dire economic consequences for the United States’ Western allies. Mr. Trudeau and French President Emmanuel Macron met on Parliament Hill Wednesday to strategize on how to talk “common sense” to the intemperate and unpredictable Mr. Trump at the G7 meeting, one senior Canadian official said. “There will be some very direct conversations on some issues where there have been disagreements. Tariffs obviously come to mind,” Mr. Trudeau told reporters in Ottawa. The G7 Summit involves the leaders − without a cast of advisers − and this will allow for no-holds-barred talk on Mr. Trump’s tariff decision and their dollar-for-dollar tariff response, a senior federal official said. The Washington Post reported Wednesday that the Trump White House is discussing more economic penalties against Canada. “I read that Washington Post story also. We have had no formal notification or informal notification from the United States of any additional measures being contemplated,” Foreign Affairs Minister Chrystia Freeland told reporters in Ottawa. She added Ottawa is prepared for any possible action the United States might take, but did not elaborate. Mr. Trudeau also shot down Mr. Trump’s call for Canada and Mexico to negotiate bilaterally to reach free-trade deals with Washington rather than pursuing talks to renegotiate the North American free-trade agreement. “Canada’s approach is and always has been that the trilateral approach is better for Canada and Mexico and the United States,” he said. Look, we are talking everything through. There may be disagreements. We regard this as much like a family quarrel. I am always an optimist and believe it can be worked out. Instead of fighting amongst themselves at the G7, the Canadian official said Mr. Trudeau will make the case that the United States should be working with its allies to press China to open up its economy. Mr. Kudlow agreed that China is the No. 1 culprit in closing off much of its market to the world while flouting World Trade Organization rules and stealing Western intellectual property. Mr. Kudlow said Mr. Trump was not afraid to come to the summit even if, as expected, he will be ganged up on trade while getting support from the leaders on his efforts to denuclearize North Korea at a summit on June 12 in Singapore with Kim Jong-un. He said the President and Mr. Trudeau have a good relationship even though they had a frank exchange in a telephone call on May 25 when the Prime Minister complained to Mr. Trump for threatening to invoke national security as the reason to hit Canada with steel and aluminum tariffs. The President followed up last week and imposed the tariffs despite Mr. Trudeau’s strong objections. Mr. Trump was reportedly referring to the War of 1812 when the British Red Coats burned down the White House in retaliation for an American attack on the Ontario town of York, the precursor of Toronto, when Canada was still a British territory. Roland Paris, a former foreign-policy adviser to Mr. Trudeau and now a professor at the University of Ottawa, said the summit will be a real test for the Prime Minister who is hosting his first international summit. The leaders are expected to offer support to Mr. Trump on North Korea but are expected to clash with him on the environment and over his decision to abandon the Iranian nuclear accord.